I received a copy from the publisher via bookbridgr in exchange for an honest review. Gretchen Muller has, as best she can, dealt with the horrors of her family’s past. Her father, a senior Nazi officer, died to save the life of their leader, Adolf Hitler. And now Germany has the chance to be great once more. Swept up in the excitement and passion of life in Munich in 1931, seventeen-year-old Gretchen has embraced the life laid out for her by that leader, her ‘Uncle Dolf’. 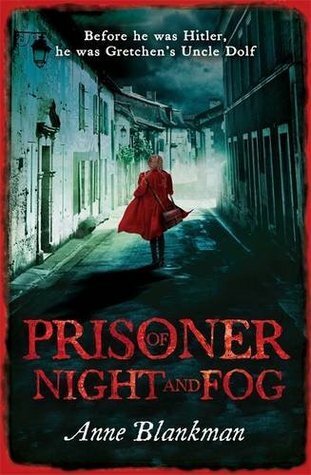 Prisoner of Night and Fog is probably one of my favourite books of 2014. It was touching, intriguing and so nice to read. As I’ve said before I’m a huge historical fiction fan and this book just ticked all the right boxes for me. It was detailed without dragging on and romantic without being too cheesy. I loved the character development of Gretchen as she slowly began to realise the reality of the Nazi party and as she dealt with her own anti-semitism. Her romance with Daniel was perfectly paced and it felt really genuine and I can’t wait to see how it develops in the next book. I enjoyed how Anne Blankman took actual parts of history and included them within the plot in a believable way. It’s normally quite risky to include real historical figures in fiction but I think that the author captured the figure of Adolf Hitler quite well in this book and his character was the perfect mix of disturbing and realistic. Reading about Gretchen’s journey to discover what really happened to her father (Hitler’s closest friend) and Hitler’s true intentions for the Nazi party made for a really compelling read.